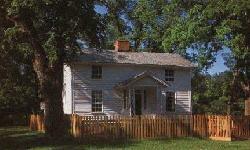 When you visit the restored Duke Homestead, you will see an authentic "living museum of tobacco history" offering activities that demonstrate early farming techniques and manufacturing processes which made tobacco such an essential mainstay of the state"s economy. Special programs are offered throughout the year, and interpreters are readily available to answer any of your questions. The patriarch of Duke Homestead was Washington Duke, an Orange County farmer whose chance discovery that Union troops were eagerly sampling local Bright Leaf tobacco led him to the canny decision to market this "golden weed." His vision--along with the soldiers" fond memories--helped Duke and others create a market for Durham-area tobacco products that eventually would transform North Carolina into the heart of a world-wide tobacco empire. Duke spent most of his life as a farmer. The death of his first wife and his subsequent remarriage brought him in 1852 to what is now the Duke Homestead near Durham Station. After the death of his second wife, he planted his first tobacco crop. He soon decided to concentrate his efforts not on farming but on manufacturing tobacco products. By this time, the Civil War was underway. Duke was drafted into the Confederate Army, making him set aside his fledgling enterprise. It was on his arrival back at the homestead that he first learned of Union soldiers" love of Bright Leaf tobacco. With his children, he began a factory in a small log structure on the homestead, processing smoking tobacco and labeling it with hand-lettered tags bearing the name "Pro Bono Publico," a Latin phrase meaning "for the public good." His product proved to be so popular that after only a few years Duke was in his third, much larger factory. In 1869 Duke"s son Brodie began a small smoking factory within the town of Durham and took advantage of the town"s railroad and tobacco market. Duke and his other sons, Buck and Ben, also moved their business there in 1874; ten years later, the Dukes began mechanical mass production of cigarettes. Many of the profits were used to invest in land and to develop fast-growing southern industries such as electric power and textiles, but many also were used for humanitarian causes. Trinity College, later to become Duke University, benefited from the family contributions.